April 27, 2011, marked the climax of a superstorm that saw a record 358 tornadoes rip through twenty-one states in three days, seven hours, and eighteen minutes. It was the deadliest day of the biggest tornado outbreak in recorded history, which saw 348 people killed, entire neighborhoods erased, and $11 billion in damage. The biggest of the tornadoes left scars across the land so wide they could be seen from space. But from the terrible destruction emerged everyday heroes, neighbors and strangers who rescued each other from hell on earth. With powerful emotion and gripping detail, Cross weaves together the heart-wrenching stories of several characters—including three college students, a celebrity weatherman, and a team of hard-hit rescuers—to create a nail-biting chronicle in the Tornado Alley of America. No, it’s not Oklahoma or Kansas; it’s Alabama, where there are more tornado fatalities than anywhere in the US, where the trees and hills obscure the storms until they’re bearing down upon you. For some, it’s a story of survival, and for others it’s the story of their last hours. Cross’s immersive reporting and dramatic storytelling sets you right in the middle of the very worst hit areas of Alabama, where thousands of ordinary people witnessed the sky falling around them. Yet from the disaster comes a redemptive message that’s just as real: In times of trouble, the things that tear our world apart also reveal what holds us together. Kim Cross is an editor-at-large for Southern Living and a feature writer who has received awards from the Society of Professional Journalists, the Society of American Travel Writers, and the Media Industry Newsletter. Her writing has appeared in Outside, Cooking Light, Bicycling, Runner’s World, The Tampa Bay Times, The Birmingham News, The Anniston Star, USA TODAY, The New Orleans Times-Picayune, and CNN.com. She lives in Alabama. "A splendid reporter, and even better writer, Kim Cross has taken a catastrophic 'act of God' that seemed to beggar description as well as explanation and rendered it as shimmering molecules of feeling and meaning. An outstanding debut." "Amid so much terror and pain and death, there is an overflowing of life here, gathered together in a blessing of uncommon decency and indelible beauty. If you want to know what shape your heart's in, read this book and learn, through Kim Cross's extraordinary reportage and artistry, that stories are as much a gift as life itself. Stories, in fact, are our afterlife." 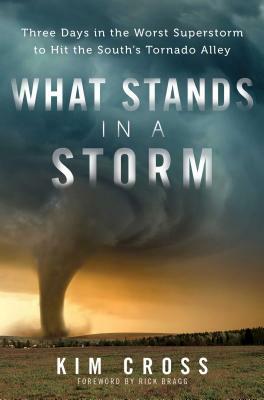 "Whether you live in tornado country of not, everyone should read this book! Kim Cross goes behind the newsreels and shows us the devastating impact that one group of superstorms had on the people of Alabama in April of 2011 and what happened long after the newsreels stopped and moved on to cover another story. Heartbreaking and heroic." "What Stands in a Storm" is a dramatic and carefully reconstructed account of nature's unexpected and explosive power and the strength of humans to bond together in its destructive wake." “With exhaustive, on-the-ground reporting, spellbinding prose and voices of the living and the dead recounting every haunting moment of the storm's three-day reign of terror, Kim Cross has produced a spine-chilling narrative. What Stands in the Storm will tear apart, forever, our complacent sense of security when we look at a dark sky overhead." "A searing testament not only to the raw ferocity ofnature's destructive power, but also to the no less awesome power of humanbeings—and human narrative—to transcend destruction and to emerge, on its farside, shattered yet strangely complete. Kim Cross is gifted, whirlwind of awriter who weaves coherence, meaning, and yes, even beauty from chaos." "In total effect, the book resembles not only the best recent models of storm reporting, but a nearly 70-year-old masterpiece that covered an entirely different sort of disaster: John Hersey's Hiroshima." "Stories of those caught in tornado outbreak churn with power... Powerful new book recreates a three-day nightmare... At the core of What Stands in a Storm are the people, brave and noble in unimaginable situations, eager to help in the post-storm war zone, aching with loss when the depths of destruction are finally measured." "Kim Cross could teach of few novelists about how to tell a gripping, spell-binding, heart-wrenching tale... Painstakingly pieced together from interviews with survivors and meteorologists, news reports, public records, and even social media accounts, Storm is a superlative piece of journalism that also is written in such a masterful way that it rivals high fiction in its use of language, plot and suspense." "Cross weaves these disparate storylines together, building a tapestry of loss and survival out of the chaos of the storms’ coming and going. The narrative remaining is so seamless, it’s easy to forget it took her 'more than a year of research and one-hundred-plus hours of interviews with responders, meteorologists, survivors and the families of those who died' to put together."